Preheat the oven to 325°. Season the ribs with salt and pepper and sprinkle with the herbs. In a large skillet, heat the vegetable oil. Add the bacon and cook over moderate heat until crisp, about 6 minutes. Using a slotted spoon, transfer the bacon to a medium nonreactive roasting pan. Working in two batches, add the ribs to the skillet and cook over moderately high heat, turning a few times, until richly browned, about 6 minutes per batch. Transfer the ribs to the roasting pan. Add the onion, carrot and celery to the skillet and cook over moderately high heat, stirring occasionally, until lightly browned, about 5 minutes. Add the wine and beef broth and boil, scraping up the browned bits from the bottom of the skillet. Pour the liquid and vegetables over the ribs. Cover and braise in the oven for about 4 hours, turning the ribs once, until the meat is very tender. Transfer the ribs to a deep platter. Strain the braising liquid into a medium saucepan. Skim off the fat and boil the sauce over high heat until reduced to 2 cups, about 3 minutes. Season with salt and pepper, pour the sauce over the ribs and serve. Soft polenta and roasted carrots. 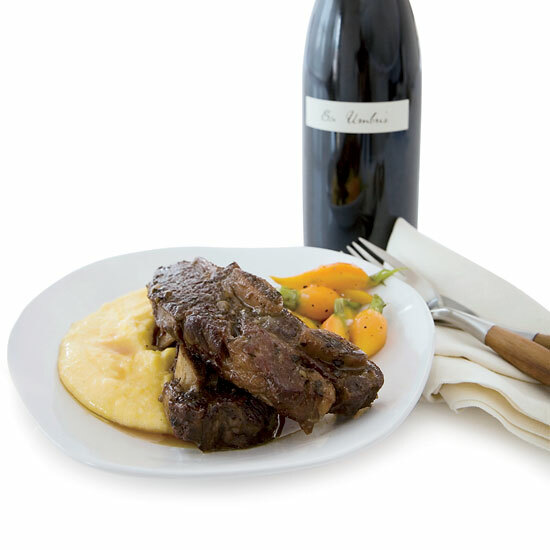 Serve with a peppery Washington Syrah.